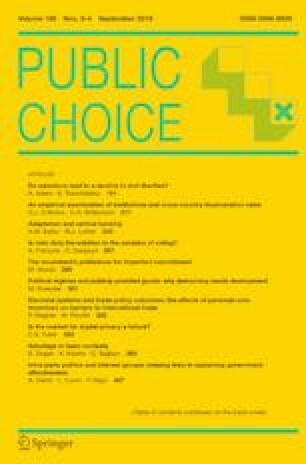 While most of the theoretical literature suggests that democracy promotes the provision of public goods, the findings of empirical studies are inconclusive. Drawing on a simple model, this paper aims at reconciling theory and evidence. We argue that the stronger dependence of more democratic governments upon public support has two opposing effects: on the one hand, it encourages these governments to increase goods provision in order to generate more loyalty. On the other hand, it raises the leaders’ incentives for kleptocratic behavior. The model predicts that the latter effect may dominate in poor countries. In countries with higher income levels, democracy is expected to increase public goods provision. Utilizing 11 indicators of education, health, infrastructure and governance both hypotheses are confirmed by panel regressions including 154 countries over the period from 1960 to 2014. We also show that the omission of per capita income as a moderator variable of democracy may result in small and insignificant empirical estimates. I thank Alexander Kemnitz for helpful discussions. I also thank the editor William F. Shughart II, three anonymous reviewers, the participants of the 16th Public Finance Seminar at WZB Berlin and the participants of the seminar at TU Dresden for their comments and suggestions. Bjørnskov, C., & Rode, M. (2014). Democratic transitions and institutional change: What’s behind the association? Working Paper, Aarhus University. http://www.christianbjoernskov.com/bjoernskovrodedata/. Accessed 4 Dec 2018. Coppedge, M., Gerring, J., Lindberg, S. I., Skaaning, S.-E., Teorell, J., Altman, D., Bernhard, M., Fish, M. S., Glynn, A., Hicken, A., Knutsen, C. H., Krusell, J., Lührmann, A., Marquardt, K. L., McMann, K., Mechkova, V., Olin, M., Paxton, P., Pemstein, D., Pernes, J., Petrarca, C. S., von Römer, J., Saxer, L., Seim, B., Sigman, R., Staton, J., Stepanova, N., & Wilson, S. (2017). V-Dem Country-Year/Country-Date Dataset v7.1. https://www.v-dem.net/en/data/data-version-7-1/. Accessed 4 Dec 2018. Freedom House. (2016). Freedom in the world. https://freedomhouse.org/report-types/freedom-world. Accessed 4 Dec 2018. Marshall, M. G. (2016). Major episodes of political violence (MEPV) and conflict regions, 1946–2015. https://www.systemicpeace.org. Accessed 4 Dec 2018. Marshall, M. G., & Gurr, T. R. (2016). Polity IV project, political regime characteristics and transitions, 1800–2015. https://www.systemicpeace.org. Accessed 4 Dec 2018. Ross, M., & Mahdavi, P. (2015). Oil and gas data, 1932–2014. https://doi.org/10.7910/dvn/ztpw0y. Accessed 4 Dec 2018. World Bank. (2017). World development indicators. http://data.worldbank.org/data-catalog/world-development-indicators. Accessed 4 Dec 2018.